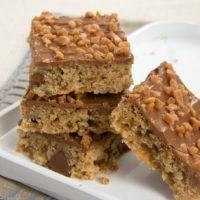 These gooey, layered bars topped with a little bit of everything are a nostalgic favorite for me. I’m sure we’ve all baked or at least eaten a version of these at some time. 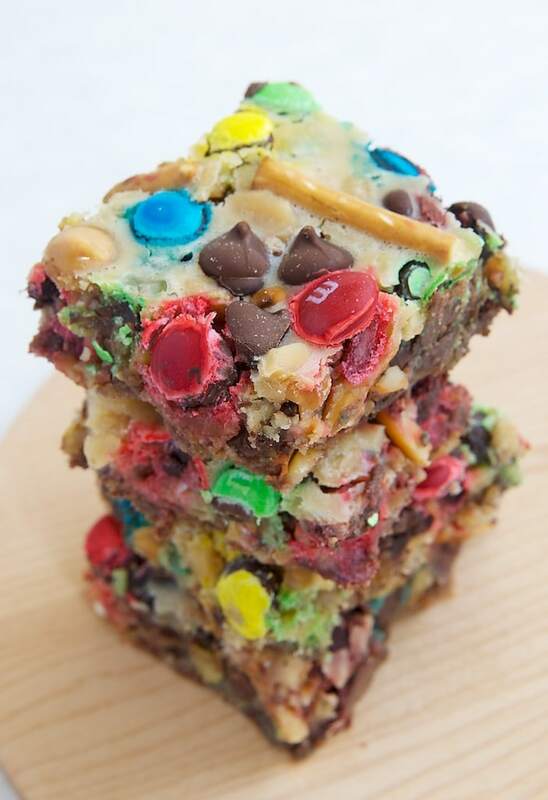 The traditional version goes by many names – Magic Bars, Hello Dollys, Double Delicious Cookie Bars. 7-Layer Bars. I like the name Build-a-Bars because that’s exactly what you do. You build these bars from a variety of ingredients. The premise is simple. There’s a cookie crust, a whole slew of toppings, and usually a filling that consists solely of condensed milk. I’ve made many, many versions of those. They’re a wonderful go-to recipe when you need a quick dessert. This version is a bit different, in that it foregoes the condensed milk for a cream-cheese based filling. And, we all know how I love cream cheese. This filling is decidedly less sweet than the condensed milk route. At Quinn’s urging, I decided to add a bit of peanut butter to the filling for a little extra flavor. That is completely optional, but I really liked that added hint of peanut butter. 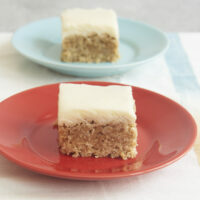 I fished around in my baking pantry for a winning combination of ingredients for the filling. I used chocolate chips, peanuts, pretzels, Rice Krispies, and peanut butter chips. I also raided our Halloween candy stash and added some M&Ms. After all, October is the one month I feel totally justified in baking with candy. While these bars are similar to the traditional version, the difference in the filling really comes through. It’s less sweet and a little tart. 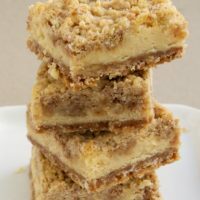 With so much going on in the filling and that topping, these little bars are very gooey and messy. And completely delicious. The original recipe for these comes from The King Arthur Flour Cookie Companion. I’ve had it bookmarked for ages, and I’m so glad that I finally got around to making them. That cookbook is one of my favorites, and it’s this month’s featured cookbook for the Baker’s Bookshelf Giveaway! 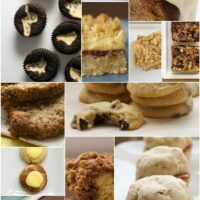 Scroll past the recipe for details on how to enter for a chance to win a copy of The King Arthur Flour Cookie Companion. Preheat oven to 350°. Lightly grease a 9″x 13″ baking pan. Mix cookie crumbs, butter, flour, and brown sugar until combined. Press evenly into bottom of prepared pan. Stir together 4 to 5 cups of chosen filling ingredients. Sprinkle evenly over cooled crust. Using an electric mixer on medium speed, beat cream cheese, sugar, peanut butter, and salt until combined. Add egg and mix until smooth. Add evaporated milk and stir until smooth. Pour topping evenly over filling. Bake 20 to 25 minutes, or until the edges are bubbly and the center is set. Cool completely before cutting into bars. Recipe adapted from King Arthur Flour Cookie Companion. This month’s Baker’s Bookshelf Giveaway is for The King Arthur Flour Cookie Companion. If you love to bake cookies, this one is a must for your cookbook collection. I’m giving THREE Bake or Break readers their very own paperback copy of this great cookbook. Please see all the details and requirements for entering in the giveaway widget below. If you are unable to see the widget, make sure your browser is updated or try using another browser. Raffle is open to U.S. residents 18 years or older. Please add bakeorbreak at gmail dot com to your address book. If a response is not received from a winner within 48 hours, another winner will be chosen. The peanut butter topping sounds yummy. I don’t like things really, really sweet. But still think dessert is on top of food pyramid! I will tinker so thanks gor inspiration! But thanks for having the giveaway! Love your blog. Admire your dedication to baking, blogging and fans. 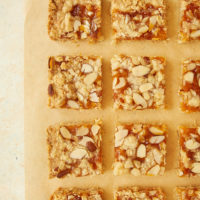 My favorite cookies to bake are orange slice! These are so fun! They are just like kitchen sink cookies in bar format! Why build-a-bear when you can build-a-bar!? The recipe looks so kid-friendly! Think you just solved my problem of what my granddaughter & I can bake this weekend. I love bars like this too! They clean out the pantry and provide a delicious treat – win-win! I like your build-a-bars because you’re not forcing anyone to add coconut. I pinned these and will be making them soon. I have a recipe for a peanut butter filled chocolate cookie, and they are amazing! 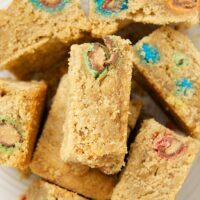 However, I love pretty much all kinds of cookies, and these build-a-bars look fantastic! Um, yes, please. I would like some immediately. I can’t even stand the amazing-ness that live in these bars. Pinned!! Is there a way to make these cookies without the peanut butter? Dawn, the peanut butter is optional. You can just omit it. 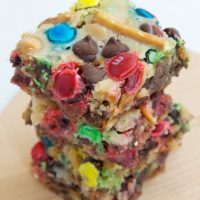 I love monster cookies – so this is a fun option to try! 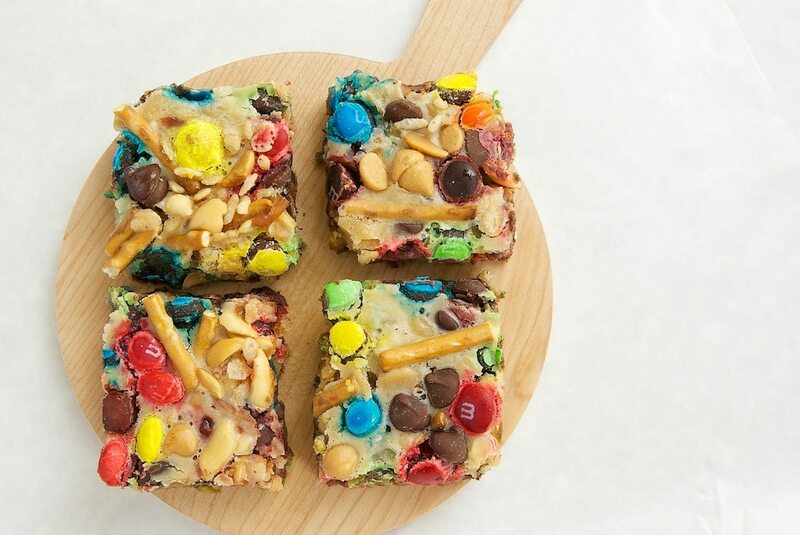 These are probably the bar cookies of my dreams. ALL THE GOOD THINGS IN EVERY BITE. Wow, these look absolutely incredible!!! These look SOOOO delicious! I love everything in them. I must give them a try.